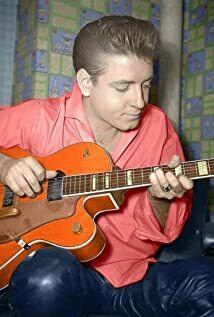 Eddie Cochran and Ned Fairchild wrote Twenty Flight Rock- Cochran’s contribution was the music. Cochran’s Twenty Flight Rock was a rockabilly tune. The song was a short one at 1:42. It was released as a single in 1957 but didn’t make the charts. It was more popular in the UK than it was in the US- during his short career he would have more success and popularity in the UK than in the US. Cochran performed Twenty Flight Rock in one of the best rock and roll movies of the era The Girl Can’t Help It- which all four future Beatles saw and loved. Paul would later cover Twenty Flight Rock on his CHOBA B CCCP album. I am nearly done with my Beatles song of the day— only a couple weeks worth of songs to go- I have been re-reading Mark Lewisohn’s first volume on The Beatles and he is always talking about records they were into in the 50’s and early 60s- and I thought- start writing about that. Cochran dead at 21- it seemed like rock and roll was jinxed back in the late 50’s -early 60’s..